Kizhi Island is one of the most popular tourist destinations in Russia which acquaints its guests with the symphony of wood. Situated in the heart of Lake Onego (the second-largest lake in Europe) at 66 km from Petrozavodsk the whole island serves as an open-air museum of wooden architecture and cultural history of the Russian North. The core of the museum collection forms the world-known church ensemble, a UNESCO World Heritage Site. It unites the Church of the Transfiguration (1714), the Church of the Intercession (1764) and the Bell Tower. Close to the ensemble you will find an ethnographic village where the life of local people of the XIX century revives before your eyes. The Museum collection consists of 83 pieces of wooden architecture of local and brought-in origin. The most ancient monument is the Church of the Resurrection of Saint Lazarus (XIV century). There is a regular water connection with Petrozavodsk from May till October and an opportunity to visit the island by helicopter or hovercraft in winter. 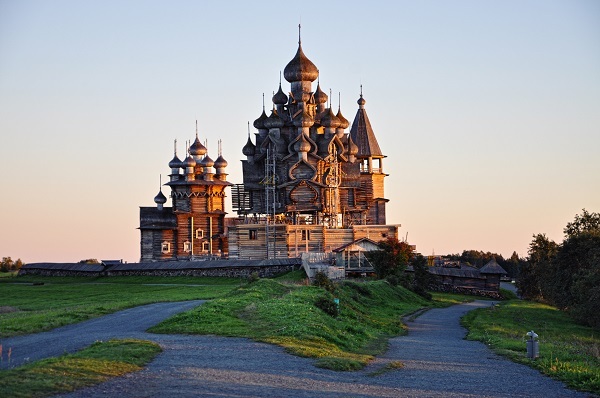 We offer 1-day trips with a visit to the marvelous Kizhi Architectural Ensemble and tours with accommodation that will give a chance to look at the cozy chapels around Kizhi Island that form the so-called ”Kizhi Necklace“ and enjoy the peaceful atmosphere of the place.